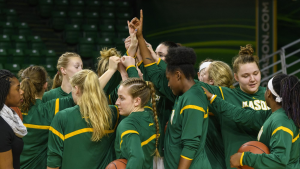 While most of us were on spring break, Monday night of this week, the Mason Women’s Basketball Team accepted a bid from the Women’s NIT tournament. 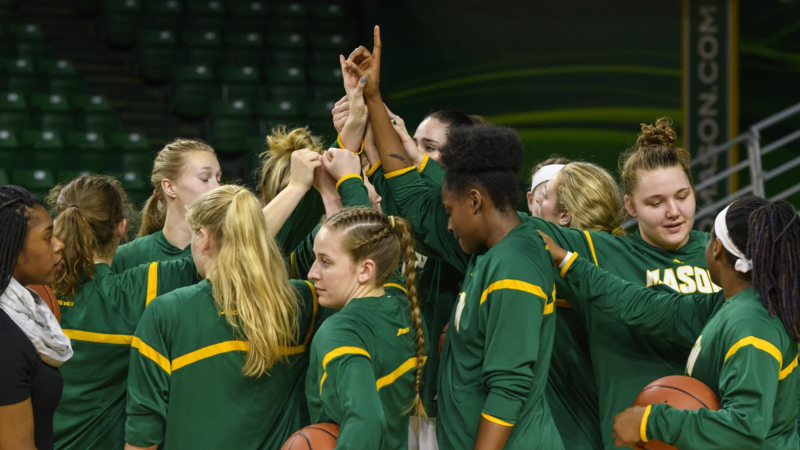 FAIRFAX, VA – While most of us were on spring break, Monday night of this week, the Mason Women’s Basketball Team accepted a bid from the Women’s NIT tournament. This marks the third time and in program history that we have qualified for the WNIT (2001, 2004, 2018). George Mason (23-9) will face Stephen F. Austin (25-6) out of the Southland Conference on Friday, March 16th at Eagle Bank Arena at 7pm. Let’s breakdown this match up and then talk about why this is monumental. This season, George Mason has averaged 69.2 point per game while only giving up 60.5 points per game. They have scored an average of 24 field goals per game in addition to 5.8 three-pointers per game. George Mason averages almost 45 rebounds per game, but one should not automatically overlook SFA’s stats. SFA averaged 72.6 points per game while only allowing 57.2. SFA made roughly 7 threes on average in addition to 37 rebounds per game. Now hold on one second, before you make any commentary on how they outscore us in multiple categories, let me say one thing. Based on what I can tell, the strength of the Southern conference is weak. There only seem to be 2 conference teams that were actually capable of beating SFA and this year in almost every game SFA won, they won by double digits, some by even margins of 70 points. One could say that Dayton only lost one game in conference play this year, and you do not see people calling the A10 a “weak” conference. However, Dayton is going to the NCAA tournament and SFA on the other hand…. was not even initially picked to be in the WNIT. It was not until Rutgers, who declined their bid, that SFA was invited to join the tournament field of the WNIT. That should tell how the WNIT’s committee looks at the strength of all the wins that SFA had in their conference. Let me just make one thing clear, we should not be worried about this team, for a couple reasons. One, the majority of SFA’s points are made in the paint, and with a 6’5” Natalie Butler, a strong defensive Nicole Cardaño-Hillary, and a good man-to-man defensive strategy, we should be able to keep SFA out of the paint and force them to shoot the outside shots. Second, from what I have seen, in the majority of games that SFA has lost, they have also been out-rebounded. If GMU can grab rebounds and Butler is herself and grabs 20 or so rebounds of her own, I have no doubt that we can beat SFA. Thirdly, SFA is 9-4 in non-conference play, and 8-4 in away games. GMU on the other hand, is a perfect 10-0 in non-conference home games, this should definitely go in our favor as we have the home court-advantage, and the greatest pep band in the country, the GMU Green Machine. As stated above, this is only our third post-season tournament appearance, not something that happens very often. To put this in perspective, I was in pre-school at the time the Women’s team in 2004 made their run. Cherish this opportunity and have fun while doing so. We do not know if we’ll be back next year. With players such as Natalie Butler and Tayler Dodson leaving after this season, who knows if we’ll be back in post-season action next year. This should definitely move you to make a push for a deep run into the WNIT. We currently have good team chemistry. Every single one of these players play a key role in this team and it allows them to work almost like perfect clockwork. This team is something special and I think Coach Milleson would agree with me. I do not know why it is that this team just sort of “clicked” this season; it could be because of Jacy Bolton, Sarah Kaminski, some of the freshmen such as Nicole Cardaño-Hillary or Marika Korpinen, or it could reason number 4…. NATALIE BUTLER. If the other three reasons are not enough for you, this one should. Just this season, she currently has 521 rebounds, 30-consecutive double-doubles, and has scored over 600 points. We do not want to let this tournament run to end empty handed. Next. N A T A L I E B U T L E R… I feel as if this one needs more emphasis. You won’t probably see another player like her at Mason for a long long time, if ever. From UCONN royalty, Natalie Butler has more than proved her worth with this squad. Please, please, let’s win this thing while she’s here, what a story that would be. Now let’s go win this game. Best of luck to you all. See you Friday. Check http://gomason.com/ for more details regarding Friday’s game and stay tuned for more sports content from WGMU.